The Integrative Genomics Viewer (IGV) from the Broad Center allows you to view several types of data files involved in any NGS analysis that employs a reference genome, including how reads from a dataset are mapped, gene annotations, and predicted genetic variants. Create a custom genome database (usually used for microbial genomes) or load a pre-existing genome assembly (usually used for the genomes of model organisms and higher Eukaryotes). Load output from mapping reads to a reference genome. Load output from calling genetic variants. Navigate the view of the genome and interpret the display of this data. Because NGS datasets are very large, it is often impossible or inefficient to read them entirely into a computer's memory when searching for a specific piece of data. In order to more quickly retrieve the data we are interested in analyzing or viewing, most programs have a way of treating these data files as databases. Database indexes enable one to rapidly pull specific subsets of the data from them. 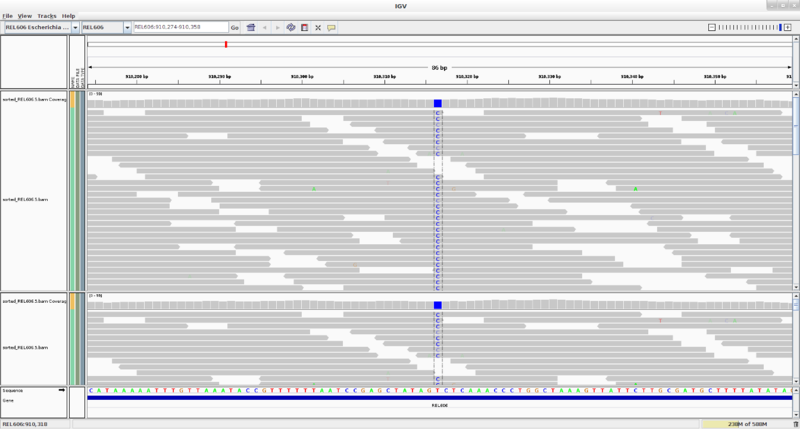 The Integrative Genomics Viewer is a program for reading several types of indexed database information, including mapped reads and variant calls, and displaying them on a reference genome. It is invaluable as a tool for viewing and interpreting the "raw data" of many NGS data analysis pipelines. If you have an intro_to_mapping directory with output from the Mapping tutorial or the Variant calling tutorial, then you should use those files for part 1 of this tutorial. You can proceed with either one alone or with both. Then skip down to #Launching IGV. IGV likes its reference genome files in GFF (Gene Feature Format). Unfortunately, our old friend bp_seqconvert.pl doesn't do GFF. So, we're going to show you another tool for sequence format conversion called Readseq. Readseq is written in java. To use it you need to first download the file readseq.jar linked from here. This should return the help for Readseq. It's a bit hard to figure out because, unlike most conventions, it takes the unnamed arguments before the optional flag arguments, there is no example command, and you have to switch -jar to -cp. Search online for usage examples when you can't figure something out from the help. Take a look at the contents of the original Genbank file and the new GFF file and try to get a handle on what is going on in this conversion. Another useful trick with either IGV or UCSC: displaying your own BLAST results: BioPerl allows for super-easy conversion from blast output to a gff file; IGV and the UCSC browser both understand GFF files. The short script bl2gff.pl does the conversion. Let's use the blast result we had from the earlier test for the JAG1 gene to show you how. You'll need to provide the input file - it's the ".oNNNNNN" output file from your blast job. The resulting jag1_blast.out.gff can be moved to your local machine and opened in IGV. Load the human reference first though! You will need to index your reference FASTA and convert your SAM output files into sorted and indexed BAM files. The "why?" behind these steps is described more fully in the Variant calling tutorial. If you are in your intro_to_mapping directory, these commands will perform the necessary steps. Repeat the last three commands for each SAM output file that you want to visualize in IGV. IGV is an interactive graphical viewer program. You can't run it on TACC, so we need to get the relevant files back to your desktop machine. ... and possibly many other types of files. The easiest way to to this is probably to copy everything you want to transfer into a new directory called IGV. Since many of the tutorial output files had the same names (but resided in different directories) be careful to give them unique destination names when you copy them into the new directory together. Now, copy this entire IGV directory back to your local Desktop machine. In the terminal connected to Lonestar, figure out the complete path to the IGV directory. For the remainder of the tutorial, work on your local machine. NOT TACC! There are two ways; Launching IGV in your web browser or by downloading the binaries locally and running IGV from your machine. This downloads the IGV executable and tells the command line to launch it (via the java command). Navigate a web browser to this page:http://www.broadinstitute.org/software/igv/download. You will need to register your email address to use this option! Go ahead and click on the "Launch with 2 GB" option. This will download a "Java Web Start" file that you can launch by locating it on your Desktop and double-clicking. After unzipping, you should be able to click on igv.bat for Windows or igv.command on MacOSX to lauch IGV. If this is not working, you might need to try the web start. From the main window of IGV, click on Genomes ? Create .genome File... and you should be presented with the following window. Enter the ID and Name of the Genome you are working with (these can be anything that makes sense to you) and select the path to your *.fasta file (the index, *.fai file needs to be in the same directory), then select the path to your *.gff file for the Gene File. And you are now free to investigate different areas and their alignments in the genome. Zoom in using the slider in the upper right. Do this until you see mapped reads and finally individual bases appear. Navigate by clicking and dragging in the window. This is how you move left and right along the genome. Navigate more quickly. Use page-up page-down, home, end. Jump to the next point of interest. Click on a track name on the left side of the window (Ex: bowtie.vcf), to select it. You can then use control-f and control-b to jump forward and backward within that list of features. Try this on the variant calls track. Jump right to a gene. (If you have gene features loaded.) Type its name into the search box. Try "topA". Load multiple BAM alignments or VCF files at once. Try this to compare a few different regions between the bowtie and BWA results. Change the appearance of genes. Right click on the gene track and try "expanded". Experiment with the other options. Change the appearance of reads. Right click on a BAM track and choose "show all bases" and "expanded". Experiment with the other options. See the IGV Manual for more tips and how to load other kinds of data. Why are some reads different colors? Hint: Try changing the display options to show read pairs and editing some of the distance constraints. What is a typical mapping quality (MQ) for a read? Convert this to the probability that it is mismapped. Remember the formula for a Phred quality score? The estimated probability that a read is mapped incorrectly is 10^(-MQ/10). Can you find a variant where the sequenced sample differs from the reference? This is going to be like looking for a needle in a haystack. Fortunately, we are going to learn how to use variant callers tomorrow and then we'll be able to zoom right to areas where there are discrepancies between reads and the reference genome that might indicate there were mutations in the sequenced E. coli. Coordinate 161,041. What gene is this in and what is the effect on the protein sequence? Coordinate 3,248,957. What gene is this in and what is the effect on the protein sequence? Coordinate 4,015,892. What is different about the reads mapped to this location? Coordinate 3,894,997. What type of mutation is this? Coordinate 1,733,647. What's going on here? See if you can find more interesting locations. There are ~40 mutations total in this sample. We're really interested in places in the genome where we think there are mutations. If you have completed the Variant calling tutorial, then you can load your VCF files to check out those spots, but first you need to (guess what?) index it. Choose "index" from the commands drop-down menu. Select your *.vcf file (Ex: bowtie.vcf) for "Input File"
It will look like nothing has happened, but you can now close the "Run" window and choose File ? Load File. If you navigate to your IGV directory, you will now see a brand new bowtie.vcf.idx file. You can now load the file bowtie.vcf, and it will show up as a new track near the top of your window. Tip: You can also index BAM and FASTA files the same way inside of IGV if you haven't already created indexes for them. But, it's usually easier and quicker to do this on the command line. Check out the rbsA gene region? What's going on here? There was a large deletion. Can you figure out the exact coordinates of the endpoints? Navigate to coordinate 475,288. Compare the bowtie, BWA, and bowtie2 alignments. Can you explain what's going on here? There is a 16 base deletion in the gltA gene reading frame. What is going on in the pykF gene region? You might see red read pairs. What does that mean? Can you guess what type of mutation occurred here? The read pairs are discordantly mapped. There was an insertion of a new copy of a mobile genetic element (an IS150 element) that exists at other locations in the reference sequence. If you've made it through the other exercises on your own data, take a look at some human genome re-sequencing data where the files can be loaded directly from public databases. Data from the CEU trio from the 1000 Genomes Project can be found directly from the Broad's server for IGV. There are now MANY genomes available this way - one of the original family trios are represented in samples NA12892, NA12891, and NA12878 (mom, dad, child respectively). Find one or more dbSNP accession numbers for SNPs apparent in one of the two 1000 genomes project trios in the GABBR1 gene. Download and install the Integrative Genome Viewer from the Broad Institute. This is whole genome coverage data; later we'll look at exome data. rs29220, rs29222, rs28359988, rs76688565, there might be more in the locus; I got tired of looking. You can also use IGV to visualize RNA-seq data in later tutorials.